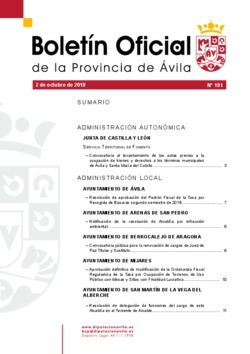 CONVOCATORIA AL LEVANTAMIENTO DE LAS ACTAS PREVIAS A LA OCUPACIÓN DE BIENES Y DERECHOS A LOS TÉRMINOS MUNICIPALES DE ÁVILA Y SANTA MARÍA DEL CUBILLO. NOTIFICACIÓN COLECTIVA DE LIQUIDACIONES Y ANUNCIO DE COBRANZA DE LA TASA POR INSTALACIÓN DE PUESTOS, BARRACAS, CASETAS DE VENTA, CUARTO TRIMESTRE DE 2018. NOTIFICACIÓN DE LA RESOLUCIÓN DE ALCALDÍA POR INFRACCIÓN AMBIENTAL. CONVOCATORIA PÚBLICA PARA LA RENOVACIÓN DE CARGOS DE JUEZ DE PAZ TITULAR Y SUSTITUTO. APROBACIÓN INICIAL EL PRESUPUESTO GENERAL PARA EL EJERCICIO 2018. APROBACIÓN INICIAL EL PRESUPUESTO GENERAL PARA EL EJERCICIO 2016. RESOLUCIÓN DE APROBACIÓN EL PADRÓN FISCAL DE LA TASA POR RECOGIDA DE BASURAS, SEGUNDO SEMESTRE DE 2018. RESOLUCIÓN DE DELEGACION DE FUNCIONES DEL CARGO DE ESTA ALCALDÍA EN EL TENIENTE DE ALCALDE.